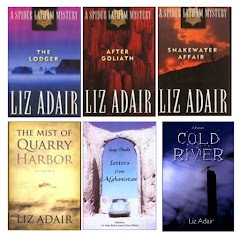 Liz Adair's musings, ramblings and recipes. 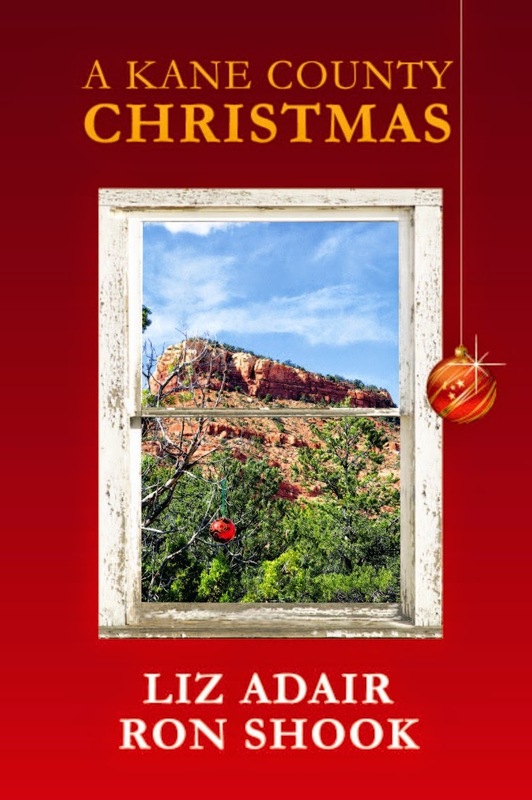 Liz is a wife, mother, award-winning author, darn good cook, holder of an opinion on just about everything, and writer of the red rock country. 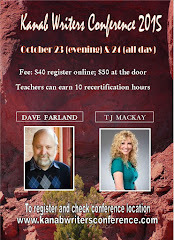 I first met Lisa Mangum at an ANWA writer's conference in Phoenix several years ago. She was the keynote speaker, and as acquisitions editor at Deseret Book, she loomed larger than life. I was shy about talking with her, even though I had already had three books published by Deseret Book. She put me at my ease, though, and when she commented that she liked my way with dialogue, I was prepared to be friends for life. That was before she sent me a rejection letter for the last romance I sent in to Deseret Book. Now, I ask you, would you trust someone to review your first novel if you had just rejected their book? I guess I look like a benign little old lady, because Lisa even wrote something nice on the flyleaf before she gave it to me. I must admit, I had a bit of a 'how good can this be?' feeling when I first opened the book, not only because of the rejection, but because I don't read young adult books. Or fantasies. Are you keeping count? Is that three strikes? Well, Lisa had me at the prologue. Gorgeously written, the whole book is a sensory experience. It's like slathering yourself in some rare and fragrant unguent while lying in a lush, leafy glade listening to a rhapsody. Eating chocolate. Lisa's wonderful prose engages every sense. This story is told in the first person, which is very hard to do. Lisa has done it well. Set in contemporary times, mostly, the story is told by Abby, who meets and falls for an exotic Italian transfer student who appears in the drama class where she is assistant director of the school play. Abby has a boyfriend, the solid and predictable boy next door, but she is drawn to the intense and mysterious Dante. As she tumbles into love with him, she tumbles into a situation that bends the boundaries of all she has ever known and teaches her about love and truth and sacrifice and possibilities, and about the boy next door. 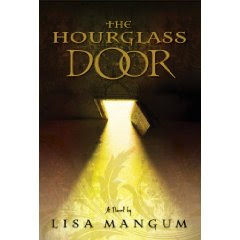 The Hourglass Door is a yummy book. The most delicious thing about it is that there's going to be a sequel. Follow this blog! Become a follower by clicking on the Follow button under the image of my Using Family History as Fiction booklet. 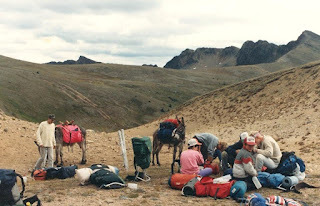 My love affair with burros began almost twenty-five years ago, when I was in my mid-forties. We were a back-packing family, and that was about the time that my husband, Derrill, started having problems with arthritis. 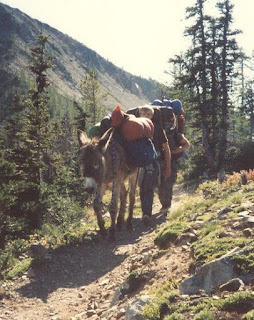 He took the young men of our congregation on a fifty mile hike each summer, and was loath to give that up, so I decided that a burro would extend his hiking years by relieving him of a pack. I wanted it to be a birthday surprise, so I had a friend put a 'burro wanted' ad on the noontime community billboard on the local radio station. The very next day, I found myself standing in a farmers yard, making a deal for a jenny burro. I paid $50 and half dozen cherry pies for her, and he promised to deliver her on Derrill's birthday. Four-year-old Clay went with me, and on the way home, I swore him to secrecy. We both wished we could afford the little foal that was by her mother's side, but Mr. Farmer wanted another twenty-five dollars for her, and it just wasn't in the budget. I have to say that was one of the cleverest birthday presents I ever gave. As we were sitting at breakfast on that birthday morn, a farm truck turned into our driveway and Clay, who had done a wonderful job of keeping the secret, jumped in the air and hollered, "It's the burro!" Well, we were all enchanted with her, and Derrill named her Tess. But, after listening to her bray all night (it sounded like two pieces of rusty metal scraping together) for her baby, Derrill traded an old manure spreader to the farmer, and we had a second burro in the barn. Next we got Molly. She was adopted from the BLM program of rounding up wild horses and donkeys on overcrowded ranges and finding families for them. Molly had been trained to pull a cart, and she always did better on a trail walking a little in front of you rather than being led. The last burro we bought was Sam. I don't think he was full grown when we got him, but he was supposed to be a gelding. He was gray and friendly and always wanted to be in the big middle of everything. If we hugged the kids, Sam wanted to be in on the hug. If we were having a conversation, he would come up from the back and put his head over your shoulder. It turned out that Sam wasn't a gelding. We found that out when our first burro baby was born. When the jennies had finished having babies, we had seven burros. Poor Sam. We called the vet and took away his social standing. The burros were an endless delight to us. We found them extremely intelligent, but a little bit obsesive-compulsive about routines. When Derrill went out to feed them grain at night, they had to be lined up in the same order at the trough, and they would chouse around and kick one another until everyone was in the proper place. If Derrill wore a different coat out to the barn, that set them all atwitter. They were gentle creatures. They would kick each other, but never when a person was around. Tess was always a bit stand-offish, but all the rest were like pets, and Clay spent a good time of each day playing with the burros while the older kids were at school. We found that they would eat almost anything. We raised pigs for years, and the burros would eat things--like cantaloupe rinds--that the pigs wouldn't eat. In fact, in the middle of the pasture was an old greenhouse that had fallen into disuse. It had an insulated north-facing wall, and those burros got in there and ate every bit of that insulation. I watched them carefully for a few days when I discovered what they had done, but the were none the worse for their fibrous fiberglass diet. Our donkeys were gentle, good-humored and social, but all are not so. When we were shopping for our last burro, we were looking at one in a farmer's corral and I, knowing only our sweet asses, patted the burro's face and murmured baby talk--which the animal immediately took exception to, bit me on the bosom, and took me right to the ground. It was a painful and embarrassing experience, and it continued to be so when the bite became infected and I had to explain to the doctor what had happened to me. When a strange dog would get into the pasture, the burros would chase him off. Same thing with coyotes. We got the donkeys too late to save our jersey calf that the coyotes got. Should have know about their watch-presence earlier. We had a Shetland pony come to visit once. We kept it for some people who were traveling through, and Sam, our gentle, good-natured, want-to-be-in-on-the-family-hug burro took that pony down in a body press that quickly established the pasture pecking order. I don't know if ponies can salute, but if they can, I'm sure that little visitor did. They coexisted peacefully for the rest of the time we had the pony. Our life was blessed by those burros in so many ways. They cleared the pasture of thistles, they made it so we could continue backpacking, and they were gentle and affectionate pets. In the next week or so, I'll write about an experience with burros I had that I put in my latest book, Counting the Cost. First I want to get the excerpt put on my web site. I hope you'll come back to read it. Follow this blog! Become a follower by clicking on the Follower button under the image of my latest book, Counting the Cost. Thanks for all who voted on the name for the light summer supper I wrote about in the next post down. My husband requested 'that cabbage salad thing' again tonight, so I realized I'd better make a decision and give it a name. Ginger Chicken Lizzy it is. In our neck of the woods, 85 degrees is a hot day, and when the weatherman says the forcast is above 90, we all sigh, for few have air conditioning up here in Northwest Washington. 90 degrees is way hot. On days like that, I don't like to cook much. Heats up the house, and besides we're not too hungy. Last week, I came up with a nice light dish that is healthy, tasty, and a good summer supper. Use 1 package coleslaw mix or cut 1/3 medium sized cabbage into fine shreads and put in large mixing bowl. Mix these all up together and make a dressing out 1 individual carton yogurt, 2 heaping tbsps miracle whip, 1 tsp grated ginger root, 1 tbsp lime juice or wine vinegar, 1/4 tsp salt and a pinch of pepper. Now, cut your leftover meat into cubes and warm it up in a skillet. While it's heating, mix the dressing into the salad. Divide it into 2 portions and put each on a plate. Top with the cubed meat and toasted almonds and enjoy it out on the patio. It's a new concoction. I came up with it the other night because it was hot and I had leftover chicken in the fridge. I tried it again tonight with pork. That was even better. So, what to call it? Ginger Chicken (or Pork) Lizzy ? Liz Adair's Chicken Salad ? Follow this blog! Become a follower by clicking on the 'follow' button under the image of my newest book, Counting the Cost. I met Laurie Lewis for the first time this year, both in her prose and in person. I took a liking to both when she wrote a review of my book, Counting the Cost. She was immediately a friend for life because she liked my book, but more than that, the way she strung the words of that review together made me know this was a serious writer. We met in person at a writers conference this last spring, and I came home with the first two books of her Free Men and Dreamers series, Dark Sky at Dawn and Twilight’s Last Gleaming. These books are set in the years leading up to the War of 1812 and follow the fortunes of Jed Pearson and his family and those of his sweetheart, Hannah Stansbury and her family. Laurie Lewis knows her American history, and she weaves bits and pieces of it into her narrative, because the forces that shape our country during this time are also shaping the lives of the Pearsons, the Stansburys, and others of their inner circles. For instance, the issue of slavery looms large, as both the Pearsons and the Stansburys are slaveholders, but Hannah is morally and philosophically opposed to the practice. Jed is swayed by her arguments, but he has the weight of running a plantation on his shoulders, and the expediency of slaveholding is something he wrestles with throughout the two books. Through his inner struggles, Laurie Lewis teaches us the realities of how this repugnant practice was able to survive for another fifty years in America. Laurie also loops us in to a couple families in England, and we see how, even as sabres are rattling on each side of the Atlantic, the lives of Americans and the British are still bound together by ties of common origins and mutual benefit. But, back to the main characters: Jed is a forward-looking, pragmatic young man, sprung from a land-owning, well-to-do family that carries a social stigma because of something his grandfather did. Hannah is studious and introspective and cares nothing for the social prominence that is her mother’s all-in-all. If they lived in this day and age, Hannah’s mother would be on a strong psycho-therapeutic drug to control her erratic behavior and mood swings, but living when they do, the family just hunkers down and tries to survive with as little damage as possible. There is great damage, though, in Hannah’s personal life, because her mother sees the Pearsons as the cause of her own unhappiness and won’t stand for an alliance between the two families. Hannah has to choose between Jed and her family. 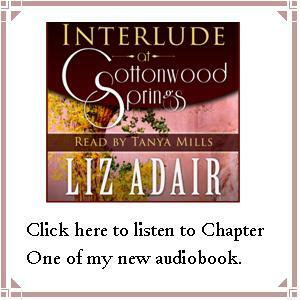 Hannah makes that choice at the end of the second book, just as the War of 1812 is beginning. The third book of the series, Dawn’s Early Light is coming out in October. I can’t wait to see what happens next. Laurie Lewis lives in Maryland, close to the areas she’s writing about. She has the ability to put the reader in the place, time, and socioeconomic riptides of our young nation. Not only does she spin a good yarn and write great prose, but she painlessly teaches American History along the way. Through Jed and Hannah, we meet some real historical people, like Lighthorse Harry Lee and Stephen Mack, uncle to the Mormon prophet Joseph Smith. Laurie Lewis lets us see them as real people, not cardboard historical figures. 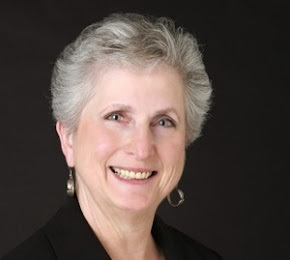 Laurie Lewis writes her historical novels as L. C. Lewis. You can buy Dark Sky at Dawn by clicking here. Click here to purchase Twilight's Last Gleaming. 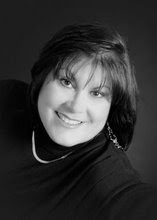 And, after you've read them and are hooked, or even before, check out Laurie's blog. You'll see what I mean about great prose, and she sponsors fun contests on her blog, too. Become a follower of this blog by clicking on the 'follow' button just below the image of my new book, Counting the Cost. Sedro Woolley is a small town that embraces the Fourth of July with gusto. Every town in the area has a celebration with street fair and parade at the same time each year, and somehow my little town snared July 4th as its day. Combining the agriculture and timber elements of our economy, Sedro Woolley hosts the Loggerodeo each year. There's a chainsaw carving contest, fun run, a rodeo, a carnival and craft fair. But first, there's a parade. Though school is out, there are usually a couple of alumni bands and a bagpipe band to mingle with the floats that businesses and neighboring towns enter. Add the logging trucks and tractors spewing candy for the kids and a backhoe that does tricks, and you've got two hours of Norman Rockwell overload. The chainsaw carving contest is right in the middle of town. Our family tradition has become manning the Pattie Wagon, flipping burgers for our favorite charity. Last year we were able to fund 8 microcredits (small loans to poor Bolivian women) by feeding people who had come to town for the festivities. This year they moved all the vendors and the carnival down to Riverfront Park, two miles from downtown where the parade and wood carving were. The grass and nearby river made it pleasant, but we lost about half the microcredits because the crowds stayed in town. This year I manned the booth to explain about SWAN. Here we are set up and ready to sell ice cream, cotton candy, hot dogs and hamburgers. Bring on the people! It was a great way to spend the Fourth. The dads of my small grandchildren took them to the parade and then joined us at Riverfront Park. The older grandchildren and friends joined as we all worked together for a good cause. And, I met some local authors who had a table set up next door. I bought some of their books and I'll be blogging about them later on. The one good thing about this year being less busy was that I was able to stay up for the fireworks. Last year, I was so beat I went to bed at seven. The fireworks were great, but if I had a choice, I'd choose the microcredits.